Did you know that there are pain relievers in the market that you can use without side effects? The 99% Pure Hemp-Derived CBD products from NutraCanna aim to help in this area in a lot of ways. With this, CBD becomes more popular as a mainstream treatment option. Are you ready to know how NutraCanna products can help you? Read on and find out. Compared to other CBD products, we have seen some preference to this product. Instead of a tincture or a capsule, it’s a dissolvable tablet. And because of this, some who tried the product found it easier to swallow compared to the other two forms. The tablet has this calming spearmint flavor and makes it much more pleasant to take on a daily basis. Its flavor is so great that at times some people forget that it is, in fact, a type of medicine. Its 0% THC content makes taking in this CBD product guilt-free in more ways than one. Most people find use in CBD products when it comes to reducing asthma effects. They also find that it helps control body inflammation and help relieve chronic pain. Its analgesic effects help a lot in managing the pain throughout the day. Each of the CBD tablets has a good amount of dosage for anyone looking to improve their health. People claim to take these to recover from illnesses and other health problems. If you suffer from more serious diseases, you might want to look at increasing dosage on a daily basis. We found the best time to take these dissolving tablets is during breakfast, just like any other morning supplement we take. In our experience, we have seen gradual pain relief within the next 30 minutes or so. It’s a reliable way to manage pains we have been having, especially with regular use. This formula works in a similar way as its daytime counterpart. When you take it, ensure that you do so 45 minutes before you sleep. This gives you the best results since it allows your body to settle down in a more natural manner. It’s common knowledge that you need to avoid over-the-counter sleeping pills as much as you can. After all, there are a lot of possible side effects that you might suffer from, depending on your situation. This applies to pain relief pills designed to improve your quality of sleep. The great thing about this NutraCanna product, is it’s 100% natural. This CBD product aims to be an excellent sleeping aid, containing 10mg of melatonin. This is in addition to the 10mg of CBD it contains. The former aims to help a lot in achieving an improved sleep quality in a more natural way. The melatonin works by stabilizing the bio-rhythm within your body. This will make you have a calm, restful sleep every night. In contrast, synthetic medicines work by knocking you out using man-made chemicals and ingredients. Combining the pain relief benefits of CBD and the sleep improvement offered by melatonin makes for an excellent sleep every night, taking it regularly as a supplement for best results. A standard CBD product, NutraCanna CBD oils aim to give all the health benefits of the CBD. It’s 100% organic, it’s vegan, gluten-free, and made without any GMOs in its ingredients. Its cultivation process complies with the USDA farming practices. What this means for you is that it has the highest levels of efficacy and purity. It doesn’t have additives and each serving has around 8mg of CBD. It’s a good oil tincture as a choice for sublingual use. The CBD oil comes from the hemp plant. It has high concentrations of CBD while having 0% THC. It’s an all-natural treatment people claim to relieve pain and other symptoms of sicknesses. Their CBD oils also come in 250mg and 550mg. Artificial pain relievers can often pose danger due to their synthetic ingredients. If you want to make the shift towards something more natural, you can give NutraCanna products a try. CBD is slowly becoming more mainstream these days. As its popularity rises, more and more people can vouch whether it truly works and helps to improve overall health. 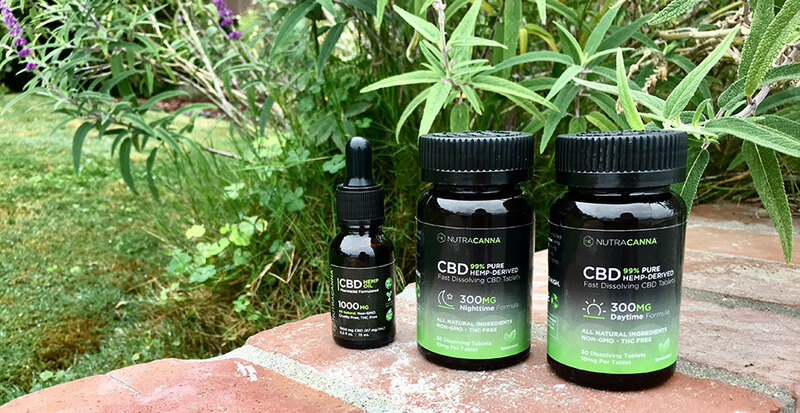 With NutraCanna, it would be easier to ease into CBD if you have not tried CBD in the past. The dissolvable tablets do great as a starter since it has a minty flavor making it seem like you are taking normal medicine or even a breath mint candy! We are starting to hear more people enjoy NutraCanna’s products. If you want to try their products, you can check them out here. Visit nutracannalabs.com for the latest deals and sales.